I got a little pond by my apartment that I like to spend time fishing in rather than studying for the test and doing the homework that are due on Tuesday. This little pond has a little bit of everything in it. It's got the usually bass, bluegill, and gar. It also has some of those black sucker fish (plectothums? 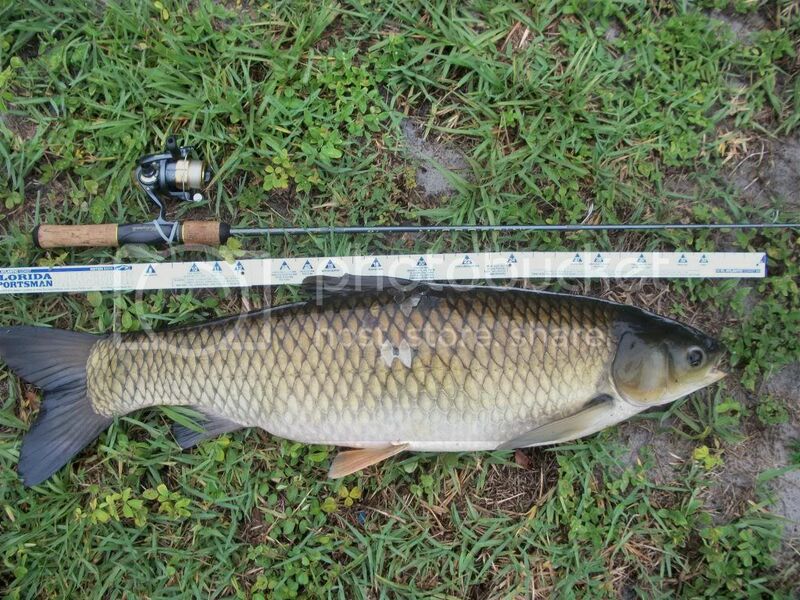 ), tiliapia, and grass carp. I bought a tiny little shakespeare microspin along with some tiny tube jigs to catch tilapia and make a sport out of it. Had plenty of sucess playing with the tilapia and small bass. Today was real overcast skies and the water was dirty from the rain of the past couple days. Got a window and walked down there. Had seen a couple carp swimming along, but i never mess with them even though ive heard guys chasing them with fly rods. Today, just bouncing that little jig on bottom and I got what felt like a redfish thump. I set the hook and my line took off. Fought this pretty decently large carp for around 30minutes on the microspin which im sure the fish was as exhausted as I was. That thing was thrashing everywhere. They do some pretty crazy stuff in the water for a fish that normally moves as fast as a manatee. I had thought when i bounced the jig that I had accidently snagged him and somehow got the tiny hook through those scales. To say the least i was astonished to see that the jig was in the carp's mouth. 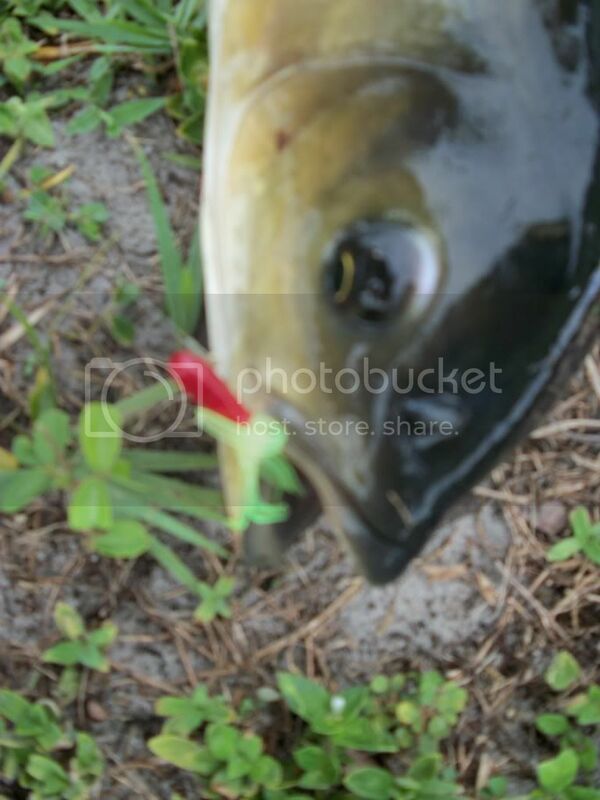 Idk if by some crazy odd chance I snagged it in the mouth sorta how i do with the tilapia, or if it actually ate the jig seeing that chartuese tail thinking it was some algae. Anyone ever had this happen before? Anyone got an estimate on the weight? I mean understand it's hard to say from these pictures, but they are the best I have since i seem to have forgotten to use the buddy system today. We have a few of those in the lakes around here. Never hooked one. Nice catch. The big ones can pull like a Donkey !!!! I'm surprised too that it would hit an artificial. Good work. That looks like a good 10-13 pounds! I used to catch these with a small hook and a chunk of bread floating on the surface and letting the current take it! I fly fish most of the time and have never caught one of these on a fly, and I read a post online about how some people spin white deer hair, or they use white Marabou or white yarn to make it look like a piece of bread. Awesome fish especially on light tackle! Thanks guys. And yeah Luftwaffe I've heard that same thing. Thinking about getting a little 6weight and maybe tryin to tie up one of them to catch one. This fish got me interested in tackling another one, but i know that chances are slim for it to happen on a jig again. This fish got me interested in tackling another one, but i know that chances are slim for it to happen on a jig again. Just keep trying, you never know what can happen! Good luck! must have been such a fun fight on such light tackle!! to me, light tackle is the best way to go. The fight is THAT much more fun. Great job..